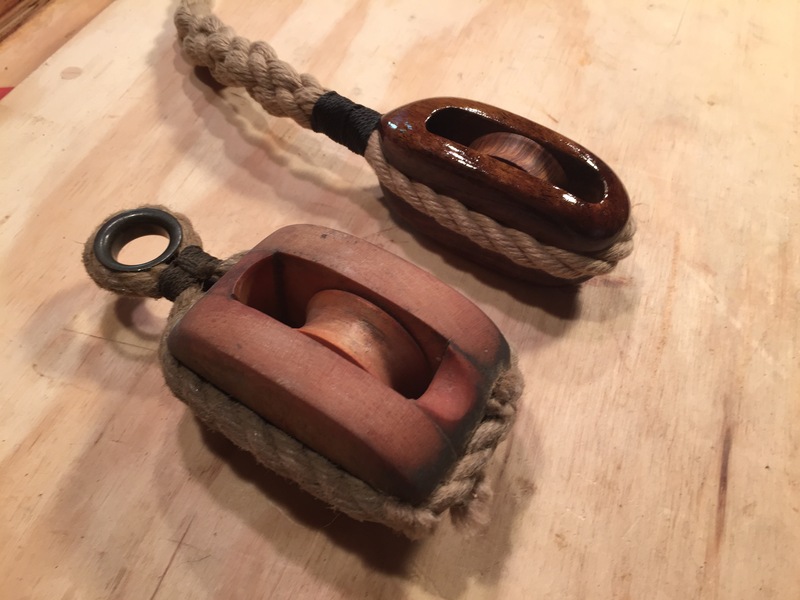 The Unlikely Boat Builder: Too Hard? One of the most exciting, and worrying, aspects of this project was working with Lignum Vitae, which has some very special qualities. It's the hardest traded wood (cricket balls and British police truncheons were made from it), and it's also so packed with natural oils that sheaves made from it are self-oiling. That's why sheaves were always made from Lignum until modern synthetics (read 'plastics') took their place. All you have to do is touch the wood to understand why: it feels waxy to the touch. Unlike any wood I've ever seen. However, I'd read gloom-and-doomster accounts saying it was so hard that it would blunt sawblades in an instant, and turn aside chisels with scorn. Would I be able to cut and shape it with ordinary tools? In a word, yes. As usual, the gloom-and-doomsters either exaggerated or (more likely) were just repeating legend they'd heard second or third hand. It cut easily with a sharp saw. Then it was time to shape it from a square block into a round sheave. 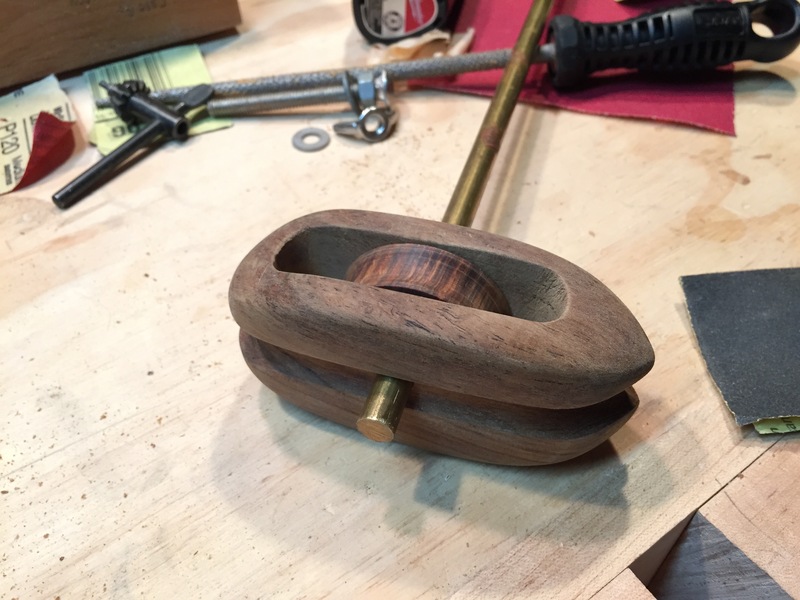 Again, I used the method found in the Duckworks tutorial to turn the sheaves in my drill press. It took some patience to work it down, but the results were nothing short of spectacular. 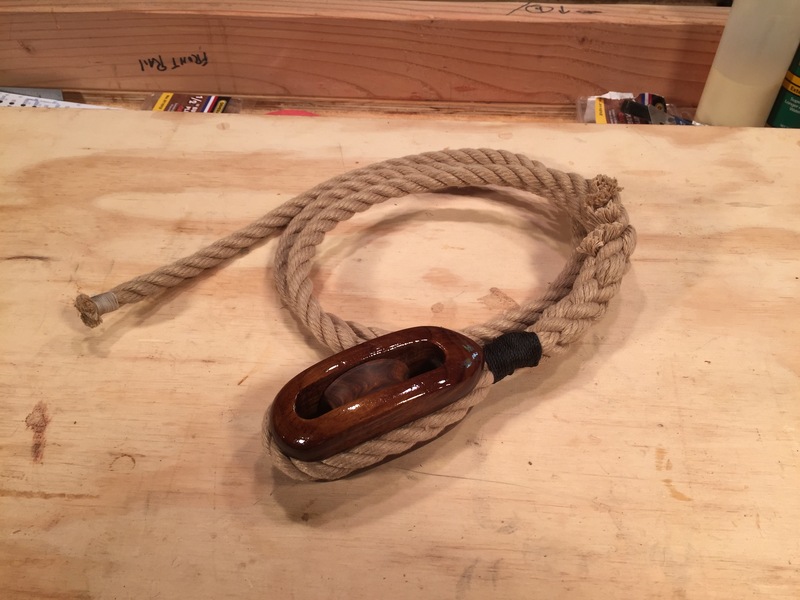 I tried the sheave in the block, and removed any points of friction inside the mortice, while keeping the fit as tight as possible. It's much easier to pare off a bit of wood inside the mortice than to adjust the thickness of the sheave, so I made all adjustments to the mortice itself. Then it was time to finish the block. 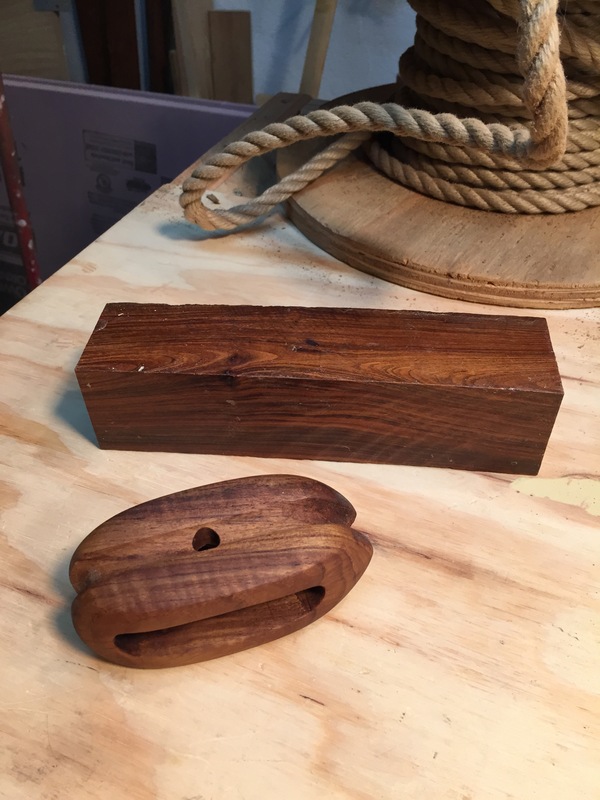 I have given up on trying to use oil as a finish on anything used outside the cabin. Even the best Scandinavian oil is only good for a week or two. Fine if you have a hired hand to oil all your blocks ever week. Not so good for normal boat owners. The only realistic finish is paint or varnish. Since I truly believe there isn't enough varnish in the world, I obviously decided to use varnish. Varnishing is dead easy, the only problem being speed: you have to count on a day for every coat of varnish. This is a bit inconvenient if you are making them one at a time, but once you have your prototype done, you could easily do a dozen at a time. Anyway, you certainly don't want to take two days per coat, so you must find a way to varnish both sides of the block at once. The easiest way to do this is to hang them. Once the varnish is dry, it's an easy, fun job to strop them. 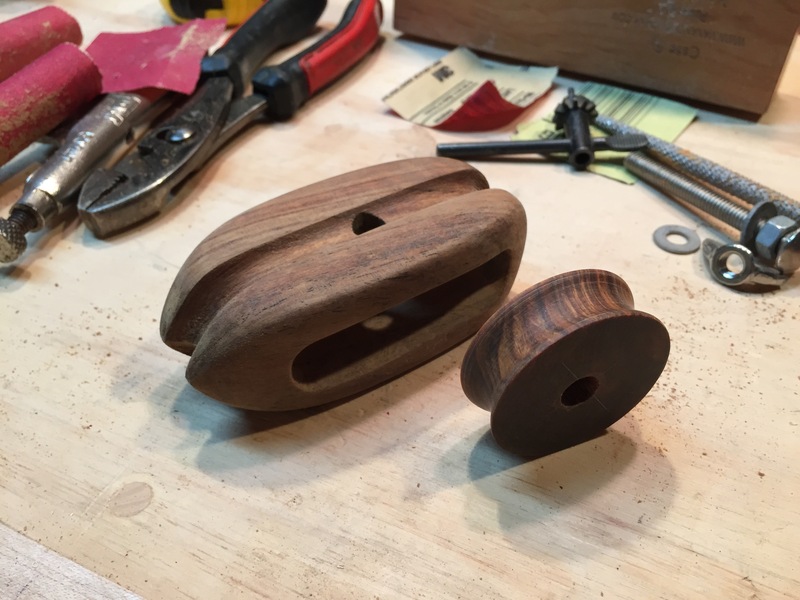 Here's the finished Mark IV block, next to the Mark II block. Quite an evolution. Since starting this set of posts, I've gotten a dozen requests for a longer, more detailed tutorial. A real 'how-to', if you will. 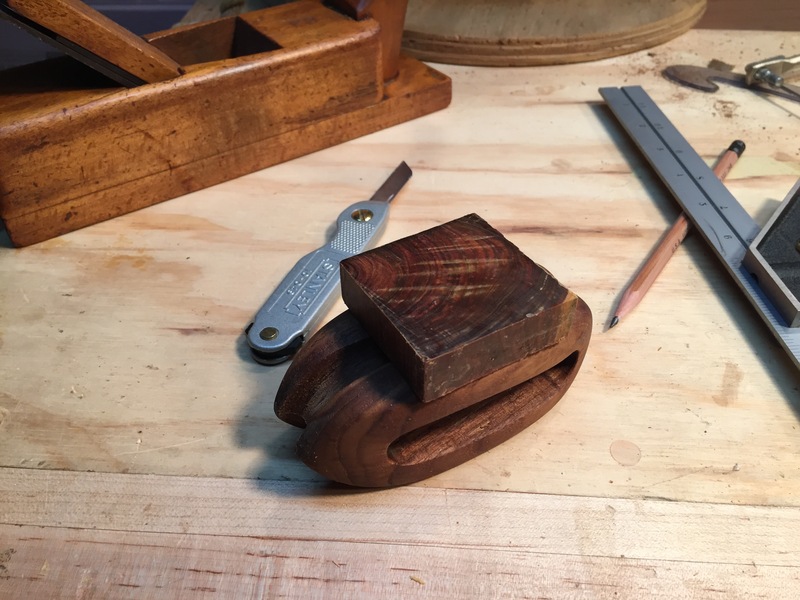 I've always considered this a 'how-not-to' blog, thinking I had more to show by showing my mistakes, rather than posing as an 'expert', but if there is enough interest, and if I reach the point that I feel like I've mastered the making of these blocks, it might be fun to share in detail. If you'd be interested in a detailed tutorial, please drop me an email or leave your vote in the comments section. Thanks for telling all this. My genuine compliments with your progress. What more details do people want? This should be clear enough, shoudn't it? What people do you fancy to cater? I'm not sure, but I might just write down all the details for myself, just so I don't forget all the tricks. John, I agree with Erwin. But I must disagree (to an extent) with you regarding oil finish on wood. Yes, it degrades in UV, but not as quickly as varnish. Yes, it is not everyone's answer to all things wood finishing. The mistake most make though, is not applying it right in the first place. 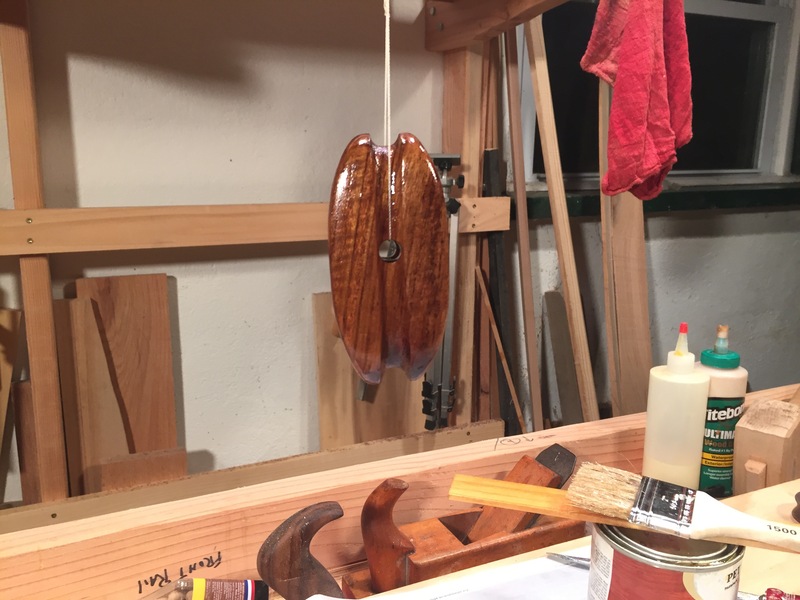 To get a good oil finish takes patience and persistence. Six coats with at least 24 - 48 hours between, as a minimum starting point. After that you start to build up a durable finish which can end up even with the shine of a varnish, if you choose to go that far. I used Deks Olje, on teak cockpit seats, and unfortunately about the fifth coat got some very large raindrop pock-marks on it. I never did manage to get rid of those marks, even when re-finishing after a couple of years or again two years after that. I guess I should say that oil hasn't worked for me. I know some people get good results. Luke Powell, for example, used deck oil for Agnes's spars. I sometimes wonder if it's not difference in environments. I don't think the British sun is quite as hot as the New York sun. We also live down wind from NY City and the rest of the coal-fired north east. It could be acidic rain. Varnish is just linseed oil with hardeners, so I think of it as a more durable oil. Deks Olje is somewhere between an oil and varnish, I think. I've never tried it. I've not had much luck with oil finishes either. The times that oil did work were times when it appeared to change surface structure (self-polymerization) and in effect became a simple varnish. As a result of that observation, I've been making my own varnish for years now. The trick is to pick an oil that tends to polymerize and then encourage it to harden that way rather than merely drying out as the solvent evaporates. It's surprisingly easy to do. The resulting finish is more elastic than commercial products, takes longer to cure, and recoats easily enough to build up a thick coat if desired. So far my simple varnish lacks the commercial high gloss, but is far more durable - especially in the sun & weather.